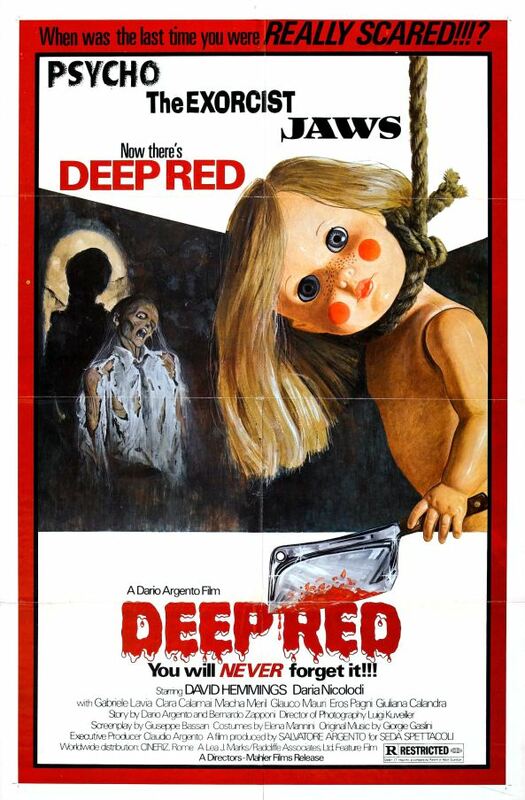 Profondo Rosso/Deep Red. 1975. Dir. Dario Argento. Starring David Hemmings, Macha Meril, Dario Nicolodi, Gabriele Lavia, Giuliana Calandra, Glauco Mauri, Clara Calamai, and Piero Mazzinghi. Rizzoli Film. 18+. 126 minutes. Not having seen every single one of Dario Argento’s films, but many, I can’t necessarily compare Profondo Rosso (English title: Deep Red) to everything else he has done. However, so far among the films of his I have seen, this has to be my favourite. Profondo Rosso follows Marcus Daly (Hemmings) after he witnesses the bloody murder of a psychic (Meril) from the street. I hesitate to say too much else for fear of ruining things. It’s a great, twisted story. The creepy child’s song which becomes the killer’s cue will stick with you long after the credits roll. The story is great. There a plenty of red herrings along the way, plenty of dark alleys with which to trouble yourself. There are a lot of giallo films out there which meander too much. Argento himself is guilty of this from time to time with certain films of his. However, in Profondo Rosso I find the story is really tight, and Argento successfully weaves a creepy tale. The look of the film is great, as are most Argento pieces. In particular, a typical ‘eyes in the dark’ scene becomes even creepier, and very different here with much attention to the colours. Argento seems to deal over and over with amazing colour schemes. Here, there is a lot of red and black. The death scenes are genius. On the Blue Underground Blu ray release, Bernardino Zapponi relates how he and Argento would come up with relatable ways for people to die. For instance, Zapponi comments on how most people do not & never will know how it feels to be shot by a gun, but everyone has at one time burned themselves with hot water, and this is how we get one of the deaths in Profondo Rosso. Similar is the idea of everyone having banged themselves off the corner of a piece of furniture roughly at one time or another forming yet another death in the film. The exchanges between David Hemmings and Daria Nicolodi are classic. The script Zapponi and Argento wrote is superb, and definitely one of the better written giallos I’ve seen. The acting itself is marvelous. Hemmings was a talented actor. Currently I’m about to watch him in Blow-Up, as well (for the first time). Daria Nicolodi fits right in with an Argento film, which is why she turns up in many of his later works like the spectacularly weird Phenomena, as well as Tenebre, Opera, and others. She also appears in the underrated Shock, directed by master of all that is horror – the legendary Mario Bava. It helps a horror-thriller when the actors can be spot on, so as to give it a legitimacy many horror genre films seriously lack. Especially nowadays, as remakes are more common (some are okay while most are generally, though I do hate to generalize in most cases, uninspired), and the teen-slasher genre has ran amok. All in all a 5 out of 5 – both for the movie itself, as well as this particular Blu ray release. In terms of the film on its own, I wish the individual who played the murderer had been someone different. I would say more, but risk spoiling too much. In any case, it certainly doesn’t ruin the film at all. Just nitpicking, which I try to stay away from usually. Highly recommended film. Especially for those just beginning an interest in giallo films, or Dario Argento himself. It’s a strange film, yet still one of the few least strange of Argento’s films, in my opinion. It is a little more accessible than some others if only because of the plot. Not to say this is simple. I just think it’s a good starting point for those wanting to explore his work. Regardless of how you come to watch it, there is lots to love. You not only get a beautifully disturbing film, it has an amazing soundtrack. Courtesy of Goblin. Argento and Goblin together are like gravy with turkey and potatoes – it just works, all the time. Watch this as soon as you get the chance. You will not regret it.